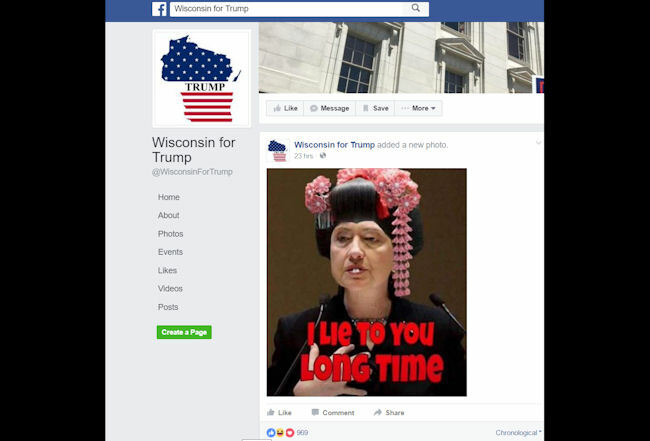 The meme features a bad Photoshop of Clinton in yellowface. She is altered to be wearing a geisha wig and bucked teeth, and her eyes may also have been altered to make them appear darker and slanted. Plastered over top the meme is the phrase “I lie to you long time,” a reference to oft-quoted line from Full Metal Jacket which is among the most popular pop culture misogynistic stereotypes of the hypersexualized Asian woman. There’s so much that’s wrong with this meme. Even if one agrees with the sentiment expressed that Clinton is a liar (which I don’t agree with), this is a racist potpourri of anti-Asian caricature of stereotype. It’s not even worth my time, I think, to explain how this meme is wrong to mix-and-match references to Japanese and Vietnamese to create a hodgepodge generically Asian caricature; or how the decision to put Clinton in yellowface via bucked teeth and (possibly) altered eyes is horribly racist; or how the need to invoke a stereotype of a denigrated, objectified prostitute to refer to the nation’s likely first female president is horrifically sexist. If you need me to explain any of this to you, you just might be reading the wrong blog. This meme, shared by a popular pro-Trump Facebook group (that does not appear to be officially associated with Trump’s campaign) is yet another example of how Trump’s presidential run has normalized racism and sexism. Trump’s followers are increasingly bold about sharing objectively derogatory and offensive material, and defy those of us who are the targets of this dehumanization to say or do anything about it. What is most offensive about this meme being shared is that it and its racist contents have become our new norm. Trump’s race-baiting has so inundated our airwaves that we expect he and his followers to share racist and sexist crap like this. This meme is so par for the course for Trump supporters that something so racially outrageous has become par for the course. In thirty days, this presidential campaign will be over, and I’m fairly sure we will have elected this country’s first female president. We can only hope that on November 9th, Donald Trump will crawl back into the cave from whence he came. But I also fear that the damage that his campaign has done to American race and gender relations will be with us for many years still to come. Update: As of Monday, October 10, the post in question appears to have been deleted from the pro-Trump group’s Facebook page.